I was looking for a cheap 5 string for home use, as I play a PJ Bass ( with flats) and a Yamaha BB1500 ( rounds) as my gigging tools but missed having a 5 string around. Having read the reviews, and liking P type basses, I thought I'd give this a go. Quick delivery from Germany with good communications and no drama! Build quality is really good, neck pocket is tight, fretting is fine and the finish is flawless. The neck is pretty chunky, but is quite comfy and the satin finish is comfortable and consistent. The colour is very dark, and I can't really discern any grain through the finish. Weight is average for a 5 string. The pots are quiet, and do what they are supposed to do. 2 volumes and a master tone give a really versatile range of sounds. I was really pleased to see a front mounted jack socket! When the bass arrived it was really well packed ( double boxed, lots of bubble wrap etc) and came with a couple of keys and a cable. Action was ok - certainly very playable, but I've made some adjustments to bring the action very low without excessive fret buzz. The main weaknesses are the strings, horrible pickguard and ( possibly) pickups - the low B sounds really weak (despite some pickup height adjustment) , but the EADG strings sound great. I'll replace the B string with a .135 D'Addario before writing the pickups off, and if this sorts the problem I'll restring the bass accordingly. I've run the bass through my practice rig ( Peavey Max 115 , Aphex Bass Xciter, EBS Octabass and Digitech Chorus) - and it really does sound pretty good. I'm looking forward to trying it with my bigger set up after replacing the low B. If this doesn't sound right, I'll link a compressor up, as the extra tension of the 135 will certainly improve the tone ( if not the output). Overall I'm very happy with the quality and sound of the bass, and it will certainly fit the bill as a cheap 5 string for occasional use. Just a shame Thomann don't list replacement pickguards for this, as a black one would look so much better!! If you're after a cheap, passive 5 string you can't go wrong with one of these - just a shame about the strings and pickguard. If it holds up ok I'll be looking at other Harley Bentons, as the value for money is astonishing. 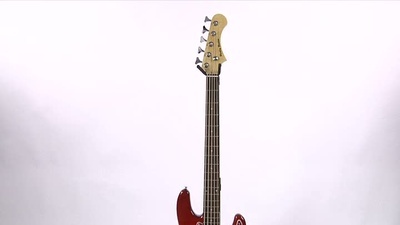 This bass has amazing build quality and value for the most part except for one major design flaw. The bass feels and plays great, build quality is solid, but the pickups don't match the string spacing of the bridge. I bought this bass so I can make demos of my songs at home without having to ask other people play bass tracks for me. 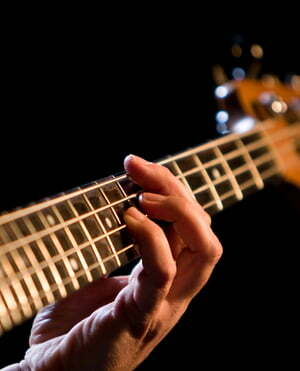 I'm not really a bass player even though I enjoy playing bass. This is the first bass I've owned (although over the years I've played quite a few) so I can' t really comment if this sounds better or worse than other affordable bass guitars. Good thing about this bass is how it feels. The neck is nice and smooth and plays well. There are no pointy fret ends and the electronics and hardware feel solid. Nothing instantly feels cheap about the bass. The setup was almost bang on out of the box. I only had to adjust the intonation of the higher strings and it was ready to go. Then the bad thing. The pickups that were put on this bass do not line up with the string spacing. The string spacing is too narrow so the outer strings don't line up with the pole pieces. And the G string is completely outside the P pickup pole pieces for the string. I was able to make it a little bit better by putting coins between the saddle pieces thus spreading out the strings at the bridge. Still the G string is not even close to being where it should be. But I don't really use the G string that much so it's not a big problem for me. Another minor issue is that the pickup output on the two lowest strings is noticeably lower than on the others. Might be just a matter of adjusting the pickup height. I'll have to look into it later. Overall I'm happy with the purchase and I may look into replacing the pick guard along with the pickups to make things sound better. Everything else about the bass is so solid that even if the upgrade ends up costing 3x the price of the host instrument I think it still will be worth it. ID: 229113 © 1996–2019 Thomann GmbH Thomann loves you, because you rock!